WASHINGTON — FBI Deputy Director Andrew McCabe, who has been attacked by President Donald Trump, stepped down Monday, multiple sources familiar with the matter told NBC News. 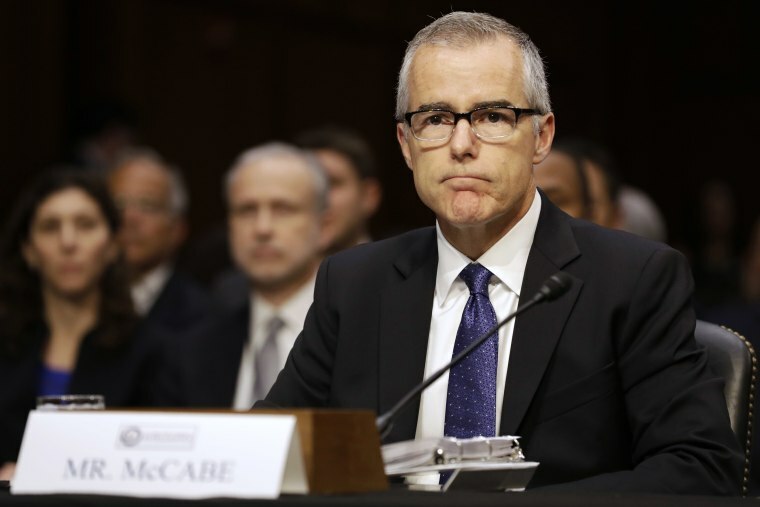 One source said McCabe was exercising his retirement eligibility and characterized his decision as "stepping aside." Earlier this month, The Washington Post reported that after Trump fired FBI Director James Comey, he met with McCabe in the Oval Office and asked him whom he had voted for in the 2016 election. Trump did not answer Monday when asked if he knew McCabe was stepping aside. White House Press Secretary Sarah Huckabee Sanders said later Monday that the White House had seen reports about McCabe's decision, but that Trump had no involvement in it. Trump, Sanders said, "didn’t play a role in any of that process" and she referred questions to the FBI. In recent weeks, Trump has taken aim at McCabe, whose office first arranged the FBI's interview with then-National Security Adviser Michael Flynn. Flynn was fired after just 24 days on the job and pleaded guilty last month to lying to the FBI and is cooperating with the Russia investigation. Last week, White House spokesman Raj Shah fanned reports of pressure from the White House to fire McCabe by saying in a statement that Trump "believes politically motivated senior leaders" of the FBI "have tainted the agency's reputation for unbiased pursuit of justice" and that the new director he appointed will "clean up the misconduct at the highest levels of the FBI." "How can FBI Deputy Director Andrew McCabe, the man in charge, along with leakin’ James Comey, of the Phony Hillary Clinton investigation (including her 33,000 illegally deleted emails) be given $700,000 for wife's campaign by Clinton Puppets during investigation?" Trump tweeted on Dec. 23. "FBI Deputy Director Andrew McCabe is racing the clock to retire with full benefits. 90 days to go?!!!" he added. In July, Trump tweeted: "Why didn't A.G. Sessions replace Acting FBI Director Andrew McCabe, a Comey friend who was in charge of Clinton investigation but got.......big dollars ($700,000) for his wife's political run from Hillary Clinton and her representatives. Drain the Swamp!" Critics of Trump have characterized his attacks on the FBI as an effort to undermine the Russia investigation — and they began weighing in on McCabe's departure just moments after news of it broke. "FBI Deputy Director Andrew McCabe is, and has been, a dedicated public servant who has served this country well," former Attorney General Eric Holder tweeted Monday. "Bogus attacks on the FBI and DOJ to distract attention from a legitimate criminal inquiry does long term, unnecessary damage to these foundations of our government." Rep. Eric Swalwell, D-Calif., a member of the House Intelligence and Judiciary committees, told MSNBC that if McCabe was departing "for any reason other than personal, this is going to be a problem" because of the president's "desire to remove people who he perceives to stand in the way of him being cleared in the Russia investigation." Meanwhile, news of McCabe’s decision came as GOP members of the House Intelligence Committee were debating whether to make public a classified document that is believe to detail that the FBI engaged in surveillance abuses. Some Republicans want to release the memo, a move the Justice Department says would be reckless and that Democrats maintain is a stunt to undermine the Russia probe.